When you're in Las Vegas trying to navigate your way in and around the city, just remember that geographically, everything radiates from the Strip. Local travel in Las Vegas is facilitated by monorail, bus service, taxis, limousines, double-decked buses, motor scooters and rental cars. The well developed air and rail systems have been serving as a significant connectivity for the tourists with the city. Airways are one of the essential modes of transport in Las Vegas. 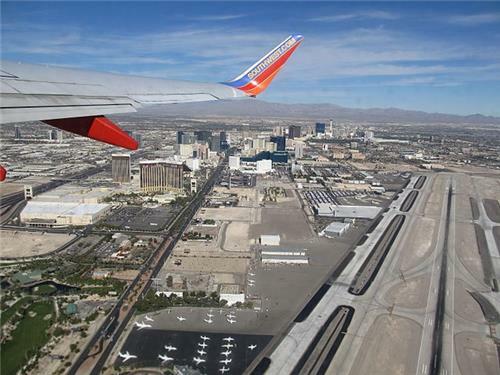 The major airports in Las Vegas are McCarran International Airport and North Las Vegas Airport. One can reach the airports by using buses, taxis, cars and Shuttle Services. McCarran International Airport is the main commercial airport for the Las Vegas Valley. It provides four runways and two terminals. The airport is the largest operating base for Southwest Airlines and Allegiant Air. The notable airlines flying out of McCarran are Delta Air Lines, Southwest Airlines, United Airlines, American Airlines and Spirit Airlines. Bus services are provided to and from McCarran International Airport by the Regional Transportation Commission of Southern Nevada. The North Las Vegas Airport is also known as Northtown. It is the second busiest airport in the Las Vegas area. Operated by the Clark County Department of Aviation, it is the primary airport in the Las Vegas area for general aviation and scenic tour. Customers can contact Customer Service on Unicom frequency 122.95 approximately 30 minutes before landing to arrange for a taxi. Customers desiring for a crew car can contact 702/261-3803 or Unicom 122.95. Las Vegas is also a wonderful place to be traveled by train. Getting to Las Vegas by train is an exciting experience. Train services are easiest and convenient networks of travel in the city. Railroads such as Amtrak and Xtrain provide rail services to the city. Amtrak is the national passenger railroad of the United States. It connects Las Vegas to other states of United States. The Club X Service is the premiere service for luxury railroad lines in the city. Local travel is one of the significant travel options in Las Vegas. Las Vegas provides wonderful opportunities for local travel. The city's local transportation is well planned, so as to ensure easy and convenient movement of the visitors. The city's monorail, buses, cabs, taxis and limousines assist in the local transportation of the people. These services are available near the hotels, restaurants and resorts. The Las Vegas Monorail is one of the best ways to travel on the Strip. The trains arriving every 4-9 minutes at the seven stations along Las Vegas Boulevard, provide fun, quick and convenient transportation to and from hotels, the convention center, and casinos. Single-ride tickets cost $5 and one-day passes go for $12 and three-day passes for $28.